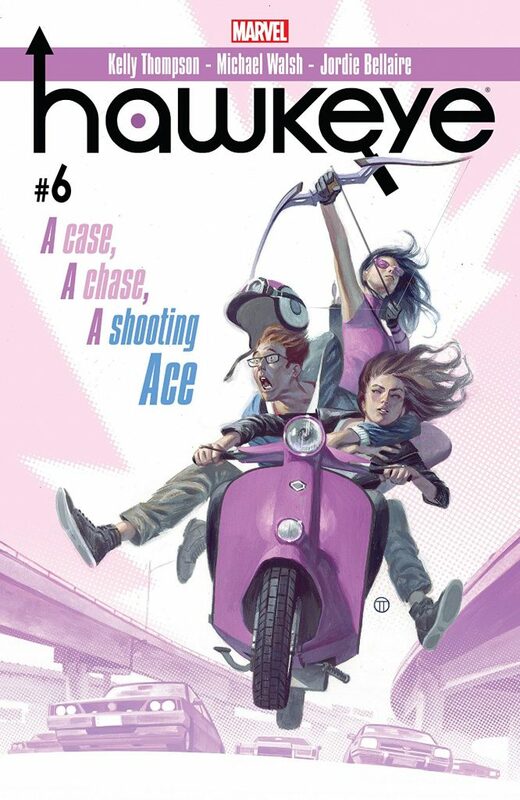 Hawkeye #6, written by Kelly Thompson with Michael Walsh and Jordie Bellaire on art, caps off series star Kate Bishop and hard-boiled P.I. 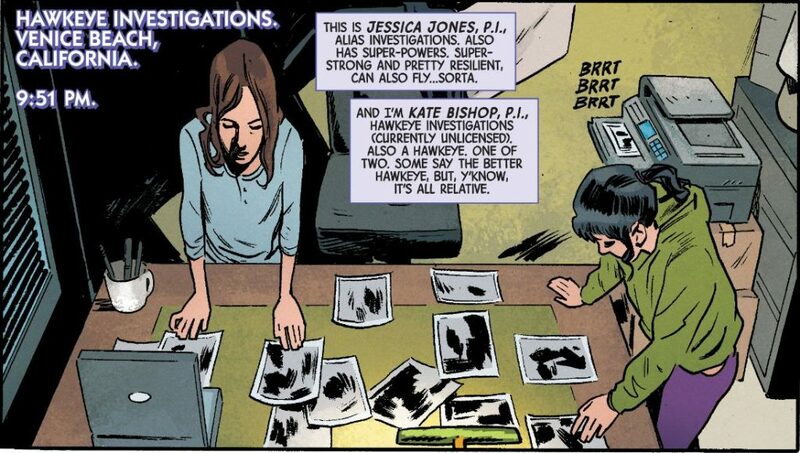 Jessica Jones’ gumshoe team-up, as they wrap up the case of the missing Rebecca Brown. And as with most detective stories, the yarn is filled with stakeouts, pouring over evidence, and a scaly dragon run amok. 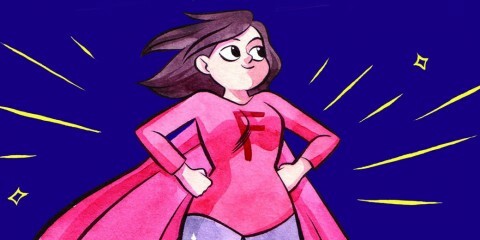 After narrowly surviving a Smaug-like attack in the form of a real-life flying dragon at a ritzy LA party last issue, Kate and Jess regroup at Kate’s private eye office to determine how to proceed in their investigation of the missing-now-found Rebecca. Rebecca’s appearance has drastically changed since she vanished, and she’s now going by the name Dhalia, making her mark as a Hollywood starlet. However, despite the shift, it’s clear she’s still unhappy, as indicated by the series of broken mirrors Jess and Kate found in Dhalia’s home. 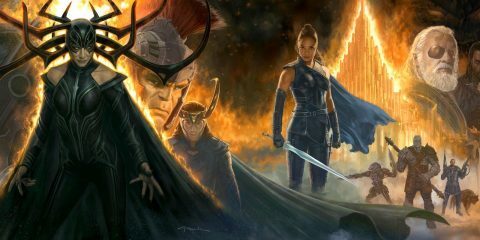 By reviewing Dhalia’s notes and tailing the asshat—as several folks refer to him—Brad, we learn what’s made her so distraught, which ties into everything from the dragon to the Inhumans to Life Model Decoys to body image issues. Thompson takes an array of seemingly disparate elements and ties them into a cohesive story that not only makes narrative sense, but also works thematically. 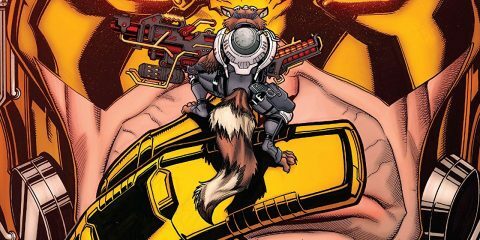 It’s a testament to her nimbleness as a writer that a new reader could pick up issue 6—the tail-end of a story arc—and feel caught up to speed, without filling the chapter with retread that might turn off readers who’ve been with the series since the first issue. 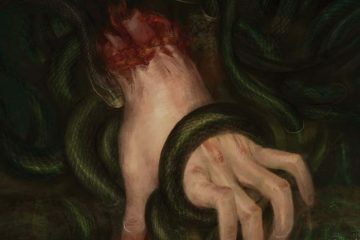 While there are a lot of moving pieces, from Jess and Kate deciding best how to proceed to explaining where the dragon came from, none of the plot feels bloated, with the plot clipping along at a good pace—but with just enough quieter moments that remind you that you’re still reading a P.I. comic book tale. Those quieter moments are the hallmark of any good Thompson tale. As she has shown with Jem and the Holograms, A-Force, and now Hawkeye, Thompson knows dialogue and characterization and uses those both to flesh out the heroes and villains themselves and to move the story along. Because of their respective backgrounds, current life stations, and ages, how Jessica would approach a caper is different than how would Kate, and that comes out in how they talk out what they should do to find Dhalia and Brad. Those moments, however, never slow down the plot; rather, they enrich the tale and make readers more invested in what’s happening. We rejoice as Kate starts putting the pieces together as to who the dragon is and why it’s acting as it is. And Dhalia’s confrontation with Brad makes us sympathize with her, and makes us see a little bit of us in her. Walsh and Bellarie do a phenomenal job at conveying the mix of pathos and punching that fill the issue. What’s particularly impressive this issue, though, is their rendering of the dragon, which is menacing enough to seem like a credible threat to Jessica and Kate, but not so much that it subsumes the identity and pain of the dragon’s true form. The color palette is also smartly chosen in that there’s a muted quality that suggests something is going on beneath the dragon’s surface. While we already knew that the art team was adept at taking us on a roller coaster ride of emotions with the human characters and their facial expressions, Walsh and Bellarie show us that they can make us care about a dragon, too. 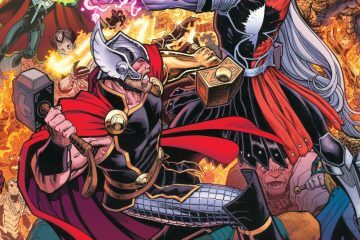 Superhero stories thrill us because they’re chock-full of action, with larger-than-life heroes trying to do good by the world, and Hawkeye #6 has that in spades. 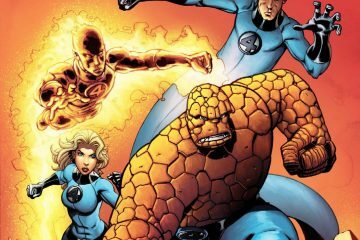 However, some of my favorite superhero comics have resolutions that don’t necessarily rely on a brute force solution, but rather one that appeals to reason and emotion. 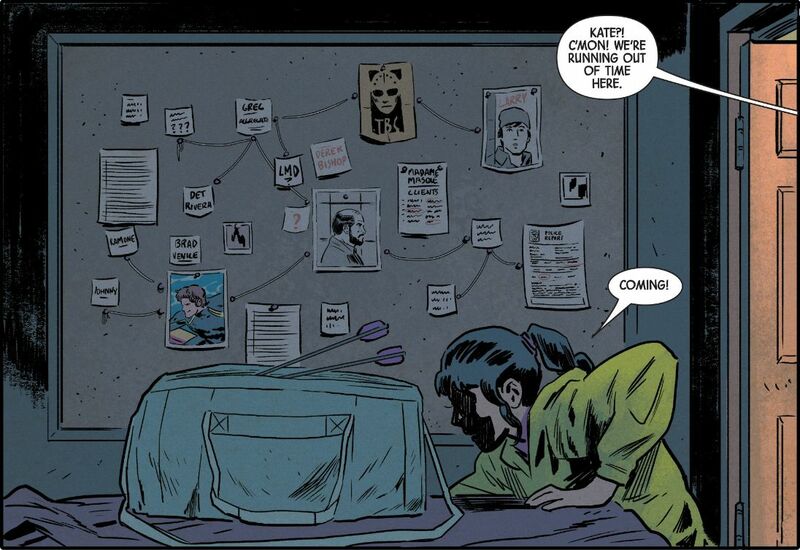 Without tipping the bean can too much on how Thompson wraps up her Kate/Jessica team-up, Hawkeye appeals to Dhalia by letting her know that she’s not alone in having self-image issues, but also that happiness doesn’t coming from running away from who you are, but embracing all of the elements that make you you. 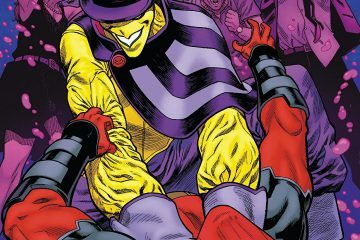 Hawkeye #6 is the perfect alchemy of private sleuthing and freaking dragons—who doesn’t love Sam Spade-style groundwork injected with fire-breathing metaphors? At the same time, Thompson and company remind us that we are have insecurities and parts of ourselves we sometimes want to hide from the world, but it’s how we stridently we wrestle with those insecurities that matters in the end. Hawkeye #6, written by Kelly Thompson with Michael Walsh and Jordie Bellaire on art, is on sale now from Marvel Comics. -Big kudos to Thompson for another nice wink to Sunset Boulevard. And is Dhalia a nod to Black Dahlia? If not, a welcome coincidence! 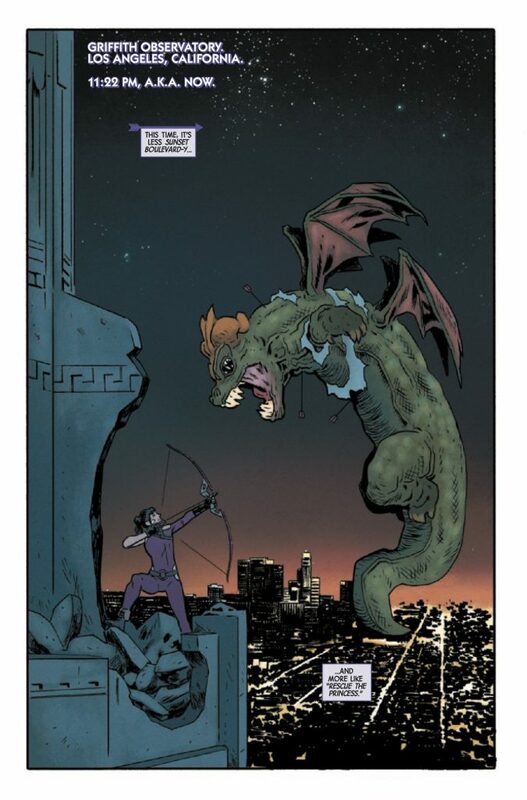 Hawkeye #6 is the perfect alchemy of private sleuthing and freaking dragons—who doesn’t love Sam Spade-style groundwork injected with fire-breathing metaphors?